Google is bounding two of its reading apps into one with the launch of Google Play Newsstand on Android devices today, putting to rest previous rumors. The new phone and tablet app brings together Google's subscription-based Google Play Magazines and Flipboard-like aggregator Currents. Google is delivering the new service to the US, Canada, UK and Australia. Android users in these countries will be prompted to upgrade to Newsstand over the next few days, although the update is available right now in the Google Play Store. There, the new app will offer almost 2,000 free and paid full-length publications that can be subscribed to or followed. 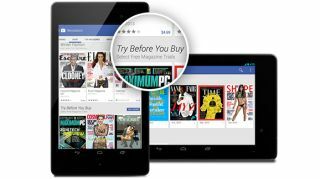 Many Newsstand magazines offer 14 or 30-day free trials, including Future's own slate of technology subscriptions like PC Magazine, T3 and the Official Xbox Magazine. Google Play Newsstand is supposed to be smarter than Play Magazines and Currents over time, according to the search engine giant. "The more you read the better it will get," wrote Mussie Shore, product manager for Google Play Newsstand in a blog post today, something we swear our third-grade teacher also said to us once. "Newsstand puts the news you care about most front and center and presents stories that interest you based on your tastes." This deep personalization could make it better than Apple's now 2-year-old Newsstand app on iOS devices. Right now, the Google Play Newsstand app is limited to Android phones and tablets. Web users can also access the store and view content using a Chrome browser. But Apple's shimmering new gold iPhone 5S and the iPad Air are ironically living in the past with Currents. They're stuck with the older app until 2014. "We'll be upgrading the Currents app on iOS to Newsstand next year," a Google spokesperson told TechRadar. Newsstand for iOS may be hamstrung by the fact that Apple is more restrictive about in-app purchases, but Google has a couple of months to figure out a workaround. It's finally here. Read our ongoing Xbox One review.